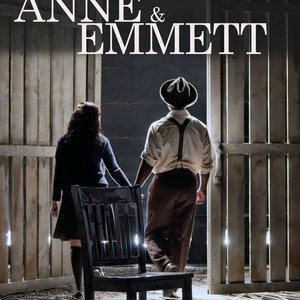 Anne & Emmett is a play that depicts an imagined conversation between Emmett Till, an African American boy, and Anne Frank, a German Jewish girl. This conversation takes place in “Memory,” a non-specific afterlife or alternate dimension. Each was killed when he/she was a young teenager because of racial persecution and hatred. Both children lived and perished in times of great turmoil and hatred for their people. Both children had big dreams for their future and were sources of pride and joy for their families. Anne Frank, one of the smallest but strongest voices of the Holocaust would have been 90 years old this year. Emmet Till, whose murder was the impetus of the Civil Rights Movement would be 78 years old. In Janet Langhart Cohen’s Anne & Emmett we experience the bright light of both young people that remains in the universe and encourages us all to remember that, as Martin Luther King, Jr. stated, “Injustice anywhere is a threat to justice everywhere. We are caught in an inescapable network of mutuality, tied in a single garment of destiny. Whatever affects one directly, affects all indirectly.” The production is directed by Broadway veteran and Theatre Morgan Professor, Reginald Phoenix. "Their imaginary conversation is offered with the hope that it will appeal to all audiences, but most specifically to those of Anne and Emmett’s age, lest they never know or are allowed to forget. Due to the topic, the guidance of parent/teacher is suggested. Includes language and situations that should be discussed prior to attending with children.